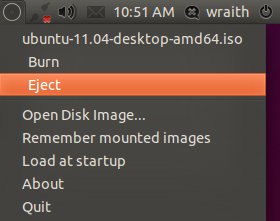 Mounty is a simple indicator applet to mount/burn cd/dvd images in Ubuntu. It can be a replacement for gnome-disk-mounter in Ubuntu 11.04 Unity desktop. Mounty supports mounting ISO, IMG, BIN, MDF and NRG and burning them into cds/dvds. After installation, launch it under Applications -> Accessories. Or search “disk image mounter” in Unity. 2 users responded in " Mounty – Indicator Applet to mount/burn CD/DVD/ISO images in Ubuntu "
Hi, I’m the author of Mounty. I don’t know why everybody posts this tahutek.net PPA – it’s not mine, it contains older version of Mounty and does not provide updates for it. Here is the original article where I presented Mounty: http://skss.learnfree.eu/archives/2724 (it’s in Bulgarian, but you can use google translate).